John Everett Millais’ Portia was misidentified for several years before the mistake was corrected at the Metropolitan Museum of Art. Following this story clues us into the life of the artist and his career. Boy Genius Millais, Notorious B.G.M., entered the Royal Academy at the young age of eleven and won his first silver medal at 1843. He was actually known as The Child at the Royal Academy, a nickname with just a hint of condescension and perhaps jealousy. While Millais was one of the founding members of the Pre-Raphaelite Brotherhood (PRB) that rejected the ideals of the Royal Academy, he remained a part of the institution for most of his life. He took on the position of Royal Academy Associate in 1853 and eventually, President in 1896. By the time Millais painted Portia, there wasn’t a single PRB bone in his body. He was painting in an academic realist manner at this moment. It is said that Millais stopped painting in the PRB style when he married Effie Gray. The marriage was quite scandalous since Gray was previously married to the critic Ruskin, one of the biggest supporters of the Pre-Raphaelites. Gray and Millais met and fell in love while she was still married. Ruskin’s marriage to Gray was annulled on the basis of “incurable impotence” since Ruskin found his wife undesirable. Clearly the marriage wasn’t a happy one. Millais and Effie Gay married after the annulment and raised a total of eight children. With such a large family, Millais could no longer afford to spend time painting his rich and detailed Pre-Raphaelite masterpieces. The youngest of his eight children played an important role in identifying the sitter in this painting. 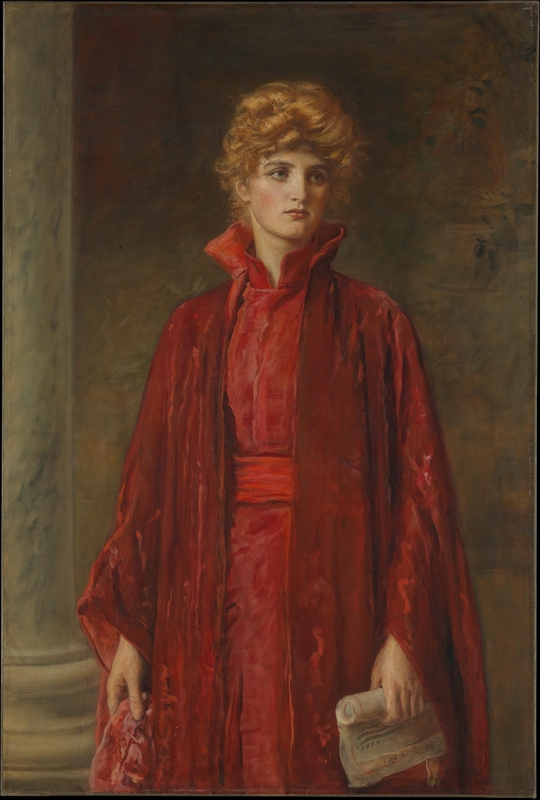 Portia was misidentified as Ellen Terry for several years because of the red dress worn by the model. Terry had posed for several Pre-Raphaelite paintings as well as Sargent’s depiction of Lady Macbeth. Terry also played Portia in Shakespeare’s Merchant of Venice over a thousand times, according to the actress. It’s not surprising that an actress that often posed for Pre-Raphaelites and embodied the same character in plays would be mistaken for the sitter of this painting. However, it was discovered that she only loaned Millais the dress. The artist’s son, John Guille Millais, clears up the story while recounting the tale of his father’s search for the model. The artist was apparently not the best at managing his schedule. He often overbooked appointments which led to his son scheduling multiple potential models to arrive at the same time. From the four models selected by the artist and his son, the young John Guille Millais recounts sheepishly that the model was one that he had booked, Kate Dolan. Oakley, Lucy. "The Evolution of Sir John Everett Millais's "Portia"." Metropolitan Museum Journal 16 (1981): 181-94. doi:10.2307/1512776. Wood, Christopher. The Pre-Raphaelites. London: Seven Dials Press, 1981. 2000 Paperback edition.